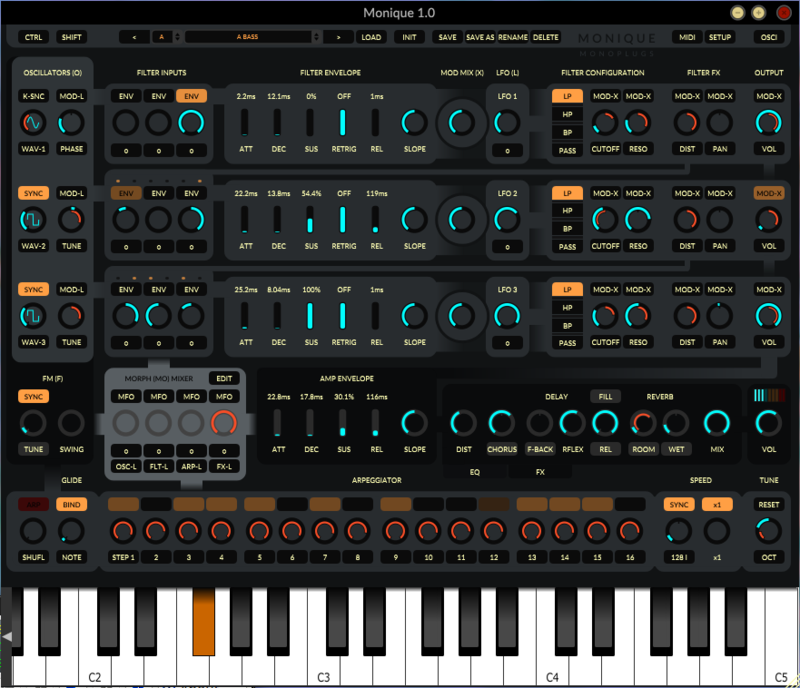 Monique is a monophonic, realtime, subtractive-synthesis bass-and-lead software synthesizer available for the linux platform, and developed by Thomas Arndt at Monoplugs.com. It has interesting morphing capabilities, making it ideal for live performance, and some useful added extras such as customizable colors and finger touch compatibility. The free demo version can be downloaded (see link below) for trial use; presets cannot be saved without purchase. Monique has four main modulation sections: oscillator, filter, EQ and arpeggiator. A "dual-slider" function is incorporated into many of the buttons, thereby allowing switching between multiple control features for the same parameter. The oscillator section includes three oscillators and one FM oscillator. The filter section includes 3 filters (lp, hp, bp) which can receive signals from any of the three oscillators, and the filtered signal can be routed to the other filters to create notch filtering, etc. An excellent general video tutorial is available HERE. There is also a Morph section which has four morphing LFOs (called MFOs) which route to the oscillators, the filters, the 16-step arpeggiator and the effects. Each MFO is bipolar and allows morphing between a selection of various settings. Control of MFO speed, etc. is also included. A morph pad is also available for morphing between the four MFOs. The effects section includes chorus, reverb, delay, distortion and a 7-band EQ. A very useful oscilloscope window with adjustable resolution is provided at the bottom of the GUI. Tooltips are provided on mouse-over, and can be disabled if preferred.